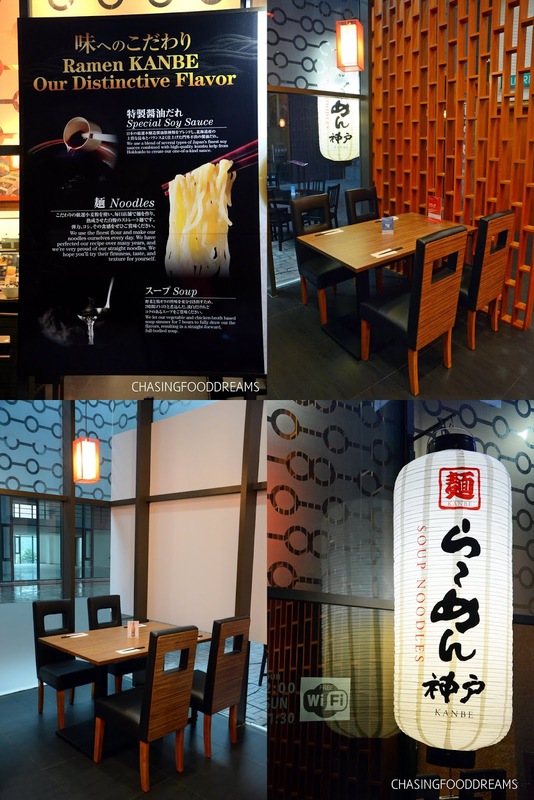 Here’s another ramen contender in town and it’s located at Empire Damansara. Ramen Kanbe is one of the latest ramen players and serves Kobe style Shoyu ramen. The restaurant is located on ground level of this quaint mall and at a discreet area which one may need to ask around to locate it. 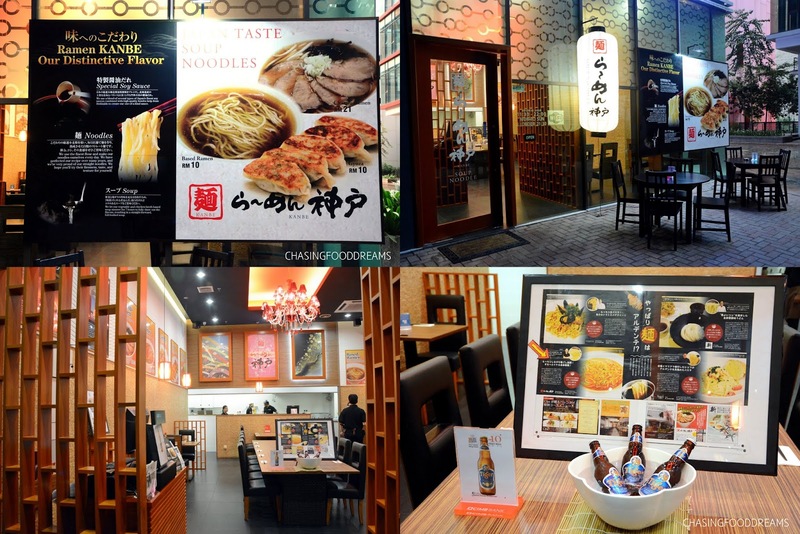 Thanks to JKdrooling and Naohiko-san, we were invited for a taste of Kobe style ramen at Ramen Kanbe recently. I do happen to be a ramen devotee so I was really interested to see how Kobe ramen would fair up against other regular Japanese styles. Walking into Ramen Kanbe, the restaurant is brightly lit and spacious. I like the whole modern wood design contrasted with black and white. One can see the injections of Japanese influences and yet there is an element of surprise with a red modern designed hanging chandelier added color and boldness to the restaurant. One can peek at the half open kitchen counter while waiting for your food as well. The menu at Ramen Kanbe is simple and offers few signatures of ramen, rice and side orders. The menu is pretty detailed with photos for easy references just like other ramen places. In the menu, Ramen Kanbe also stated that their custom blend of soy sauce if the key to all their signature ramens. The restaurant also makes ramen from scratch and their vegetable with chicken-broth based soup simmered for 7 hours. Shoyu ramen broth is clear with a rich brown shoyu color and is more delicate than other tonkotsu or miso based ramens. Diners can enjoy the aromatic and delicate broth with ramen and other condiments in the Shoyu ramen. Ramen Kanbe’s drink list is minimal but sufficient with its usual Japanese Green Tea and others like Oolong Tea, Lemon Tea, Coffee, Coke and Beer. We tried their Lemon Tea (RM5) and Red Milk Tea (RM5) which is pretty decent. Karaage (RM10) proved to be one of the highlights at Ramen Kanbe. The Japanese style fried chicken is crispy with a juicy inside. The boneless dark meat is very tender and tasty too. It was so good, we had another order of this fried chicken served with crunchy shredded cabbage and mayo. Another side order that is worth ordering is the Gyoza (RM10). This is a super popular snack in Japan and also happens to be served at most ramen places as well. The pan seared dumplings has a nice crisp side and a soft one on the other side. The filling is tender and flavourful and makes great snacks while waiting for the ramen to be served. My little one loves fried rice and so we had an order of Ramen Kanbe’s Fried Rice (RM12). It is a flavourful plate of fried rice with a nice aroma. There are bits of meat in it and the rice is fluffy and moist. My only gripe about this dish was that the portion is a bit small for its price. Our ramen arrive and the first one was the Charsiu Ramen (RM21). A bowl of house signature ramen with plenty of pieces of Charsiu nicely covering the whole bowl also had some black fungus, bean sprout and spring onion too. The ramen noodle is nicely cooked with tender texture. The broth is rather delicate with good essence of meat but not heavy or overpowering. One can taste the subtle notes of sweet and savory soy sauce in the broth. The Charsiu pieces are also very tender and are lean as well. Ramen Kanbe’s ramen is definitely different from the many ramen places I have tried. There is a refine flavour to the overall bowl of ramen. It is easy to enjoy and won’t leave you with a heavy after taste. The price is also cheaper than most ramen places. I rather enjoy the ramen for its refine flavour and it is pretty comforting. There is also another version with Wantan and Charsiu in the Wantan Ramen (RM21). This version features the same as their house signature ramen but has the added bonus of wantan dumplings together. The wantans are decent with thin dumpling skin and soft filling. I have never had ramen with wantan before but this is not too bad. It certainly makes a nice change from the usual ramen joints. I chose the Spicy Ramen (RM21) because I was curious about the flavour and I also happen to love spicy flavours. My ramen comes with a minced meat topping rather than the charsiu thought I did wished for the charsiu. Fear not, one can put in additional orders of Charsiu (RM4 – 3 pieces) and Boiled Egg (RM3) like I did. The Spicy Ramen had good solid flavours of heat and a bold and robust flavour. Its savory flavours really stand out together with the spiciness of the chili. The sheer simplicity of this ramen with minced meat and chives in a spicy broth showed that Ramen Kanbe can produce bold flavours in their ramen as well as they delicate and light Shoyu ramen. I discovered that I do enjoy cold ramen after tasting it few times. So when I saw that Ramen Kanbe also has a cold ramen named Reimen (RM21), I decided to order this to share together with my foodie buddies. Cold ramen usually has a firm al dente ramen texture which is what I love. Here it is the same again where the ramen noodle has a solid bite in texture and is served with crunchy black fungus, egg, lettuce, pickled ginger and shredded Charsiu together in a chilled soy based sauce. I liked it. I think I ate most of this as I like how satisfying the chilled ramen tasted like. Our last dish of the evening was definitely comfort food. Tenshin Han-Rice (RM15) is another dish that showed off the delicate flavours of savory with tinges of sweetness. Fluffy white rice is nicely wrapped with an egg omelette sheet and bathed in a light soy sauce broth. Ramen Kanbe is pretty interesting. The restaurant makes a nice change from the usual heavy flavoured ramens. I believe that this is also a first ramen joint to feature Kobe style ramen. The evening we were there, service was also fast while the wait staff was pretty friendly too. Here’s one place that you can enjoy a bowl of refine and delicate Shoyu Ramen with a few extra goodies thrown in! This set contains their most popular dish Ramen, 2nd popular dish Tenshin-hanrice and the choice of 3 various teas together. 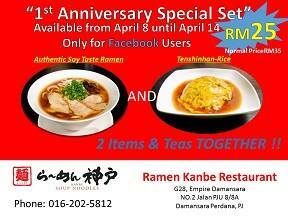 They serve this great value set exclusively to Facebook users from april 8th until 14th. Other guest will be able to be served this after April 15th for 2 weeks till end of April.